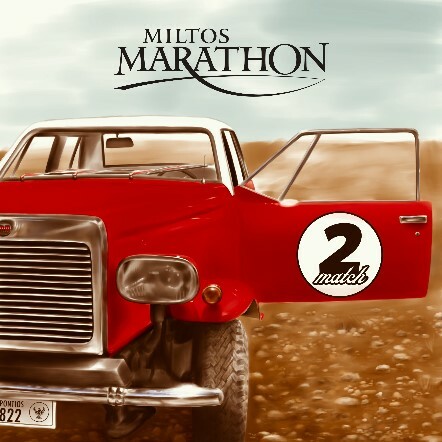 Miltos Marathon :: Official Site Miltos Marathon :: "Two match"
“Two match” forms the second official album of Miltos Marathon, which was released as an independent production at the end of 2017. These compositions created in the mid 90’s, were released that time as a demo entitled “Too much trouble for nothing” and for many were a fine specimen of the musical style of Miltos Marathon back then...Later were characterized by friends and fans as favourite and classic songs of the band.. The title “Two match” has a metaphorical meaning and at the same time creates a kind of pun as it refers firstly to the title of the demo, secondly to this album and thirdly to the similar musical components that this album shares with the first album of Miltos Marathon“Grek fill”. "I didn't want just to make a re-recording, I wanted to revive the enthusiasm as well as the romance that prevailed in that period of my life and present some of my first compositions,in the light of the current reality, to the friends and fans of Miltos Marathon.." Miltiades has stated . The production and mastering in “Two match” were completely made in Miltiades Chalkidis’s personal studio by himself, who wishing to offer a more personal tone in this album, not only selected the guitars and vocals, but also took on the playing of bass, keyboards and percussion. For the remaining needs of the recording, a group of musician friends was gathered and the drums were recorded by Constantinos Mitin while the women's vocals were performed by Otilia Barbulescu Samoulada and Stavroula Asterinou. “Two match”is not just the second official album release of Miltos Marathon. This album constitutes a kind of linking bridge between the past and the present music universe of the band..